Get a better grip with Malco’s Offset AV Aviation Snips! 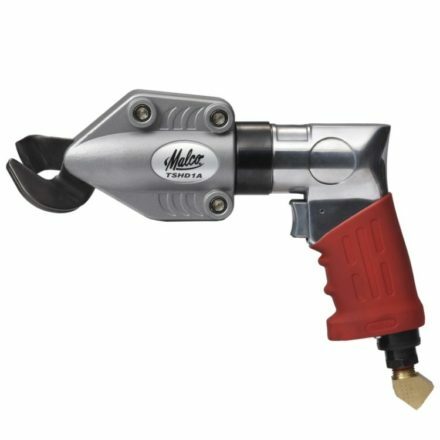 Malco Offset AV Aviation Snips feature grooved non-slip POWER-FIT™ performance hand grips. These enhanced grips naturally distribute pressure evenly across the user’s hand, resulting in a more natural feel with less fatigue and increased strength. Safety hand guards allow the user to cut quickly into sheet metal, while preventing the hand from slipping forward over the blades. A self-opening latch provides convenience for the user to quickly open the snips when ready. Made with only the best, the hardened forged steel jaws offer a strong long lasting cutting edge. Available in left, right, combination, offset-left, and offset-right cutting models. Click here to view the left, right, and combination cutting models. Cause the supply houses stopped carrying them for some reason. I have these and the reds. Best snips made IMO. I had my last pair for 4 years till my helper used them as a hammer. Other than that they were bullet proof. I need to use cutters every day cutting sheet metal on the job. These are about the best I have found.